The commander of the Soyuz was Alexander Kaleri (Russia). The flight engineer was Michael Foale (USA), and Pedro Duque from Spain served as the second flight engineer. After docking with the ISS they exchanged the current crew on ISS and became the eighth station crew, called "ISS Expedition Eight". During the stay on the station Michael Foale was the ISS Commander, while Alexander Kaleri was the engineer. Foale was the first American to have served on both Mir and the ISS. 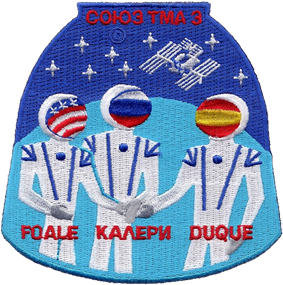 Pedro Duque performed some ESA sponsored science experiments under the mission name Cervantes and then returned with the ISS 7 crew on Soyuz TMA-2. The backup crew was William McArthur, Valery Tokarev and André Kuipers. Foale and Kaleri along with André Kuipers, the third seater from TMA-4 landed on April 29, 2004, near Arkalyk, Kazakhstan. A minor helium leak did not affect their mission. 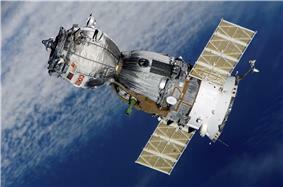 ^ a b c "OFFICIAL PRESS RELEASE about the landing of Soyuz TMA-3 descent vehicle". ^ "Return to space for Spanish ESA astronaut".